After complaints from residents, on Dec. 1 the Jeju Government decreased the maximum fee of the express bus from 4000 won to 3000 won. This change comes just three months after service started. As well as this, there will be a new express bus route that starts at Hagwi-ri in Aewol and ends at Hamdeok-ri. 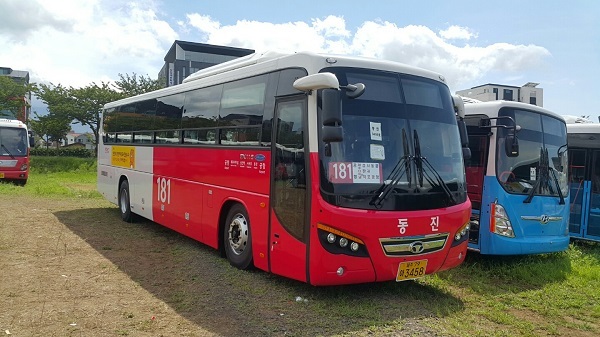 On Aug. 26, Jeju changed its bus system by establishing four new types of bus. These are the express bus, mainline bus, feeder line bus, and tourist bus. The fee for the mainline and feeder line bus is 1200 won for adults, 900 won for teenagers, and 400 won for kids ages 6~12 years old. Originally, the fee for the express bus was 2000 won for the first 20 km and then 500 won for every 5 km after that. There was a maximum fee of 4000 won for adults, 3200 won for teenagers, and 2000 won for kids. However, after complaints from citizens, the price has been changed so that there will be a base fair of 2000 won which will increase 200 won every 5 km to a maximum of 3000 won. The express bus that will run from Hagwi-ri to Jocheon Hamdeok-ri will start by the end of this year. The route will go straight down the Il-Ju road and not go through the airport. Jeju official said that “we are planning to complete the system and decrease the fees within the next year."